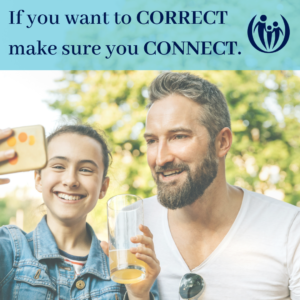 If you want to correct, make sure you connect! The first dad was angry. I answered his phone call and heard a wide assortment of issues. His son was hanging out with a group of friends the dad did not like at all. He’d caught his son stealing, lying, and drinking. “No son of mine is going to act this way!” he loudly proclaimed over the phone. It’s easy to understand why a parent discovering these behaviors would be upset. When our hopes and dreams for our children are threatened by their poor choices, we get anxious about what the future might hold for them. We’ve made a huge investment in these kids and we don’t want them to throw it away with youthful and irrational choices. So we dig in our heels. This dad was digging in his heels. He was at a loss for how to get these behaviors to stop, so he called me. “Are you kidding!” he erupted. “You think I’d do anything fun with a kid that’s acting this way? This has been going on for months and it’s gotta stop. Now!” I told him that I understood, but that the key to gaining the kind of influence he desired was linked to how connected his son felt to him. He told me he didn’t call me for this kind of psycho-babble and he hung up the phone. I never heard from him again. I have yet to see a parent maintain this sort of attitude and anger toward a child and end up with the results they hope for. When parents stay embittered toward their kids and focus solely on behavior, the disconnection leads to resentment of all kinds – even estrangement. So my prayer is that this dad somehow remembered my words and at some point decided to find ways back into connection with his son. The second dad was angry too. He despised the company his daughter was keeping and as he increasingly put limits and consequences in place, his daughter increasingly escaped his suspicious surveillance. So I asked about his relationship with his daughter, hoping to discover things the two of them had enjoyed doing together in the past. “What if you used your phone to connect with her?” I asked. “I don’t even know how to use all that stuff.” he answered. “Know anyone who could teach you?” I hinted. “You think she would?” He was skeptical but willing. Two weeks later I touched base with this dad again and he was hopeful (maybe a touch ecstatic). He had used messaging to send the same endearing words he once spoke to her live. His daughter wasn’t exactly jumping into his arms, but she was slowly reconnecting to him. 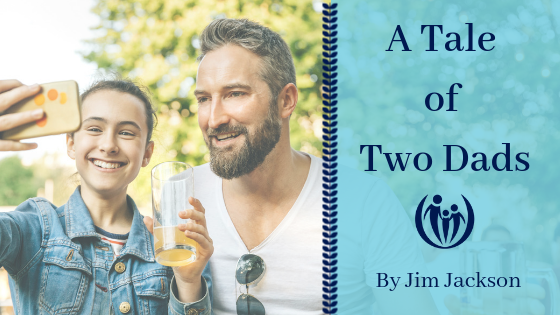 Now, several years later, after sticking with her through numerous poor choices, dad reports his relationship with his daughter couldn’t be better. The power of connection, even when it doesn’t seem warranted, should never be underestimated. It might be a handwritten note or a gift of some sort with no strings attached. Some parents play video games with their kids. Some watch a kid’s favorite YouTube video with them. So many options. Keep it light. Keep your hurt at bay. When kids’ behavior is difficult, it often drains a parent’s desire to connect with that child. Kids perceive our distance as rejection and may even make more poor choices out of that hurt. This dynamic can easily become a downward spiral. So if there is a discouraged and misbehaving child in your life, find a way to connect. You will likely not see changed behavior right away, but connection that truly expresses unconditional love and demands nothing in return is your best shot at regaining the influence you want with your struggling child. Hey, dads, want to learn more? Jim recorded “Encouragement From a Dad Who’s Been There” thinking about dads (although moms can listen too!). If your wife has recently been digging into our material and is urging you to “get on board!” this is a great place to start!